New Canaan’s Quintin O’Connell (22) breaks upfield splitting Danbury defenders during the first half at Dunning Field on Friday in New Canaan. NEW CANAAN — During a pregame ceremony honoring late New Canaan assistant coach and former player Jason Cooper, Rams senior Quintin O’Connell could barely contain his emotions. O’Connell, who is wearing No. 22 in honor of Cooper, did the one thing he knew Cooper would want him to do, going out and playing the type of football New Canaan is accustom to. O’Connell scored the first touchdown of the game on a 2-yard pass from Drew Pyne as he and the No. 7 Rams rolled from there, defeating Danbury 42-6 Friday night at Dunning Stadium. O’Connell said the pregame moment of silence for Cooper, who died unexpectedly this summer, was one of the toughest moments on a football field in his life. New Canaan was also coming off one of its worst losses in recent memory after being shut out by St. Joseph in Week 1. The Rams quickly vanquished the bad taste in their mouths by scoring 21 points in the first quarter. Pyne hit O’Connell twice in the first quarter, also hooking up with Wyatt Wilson for a 25-yard touchdown. 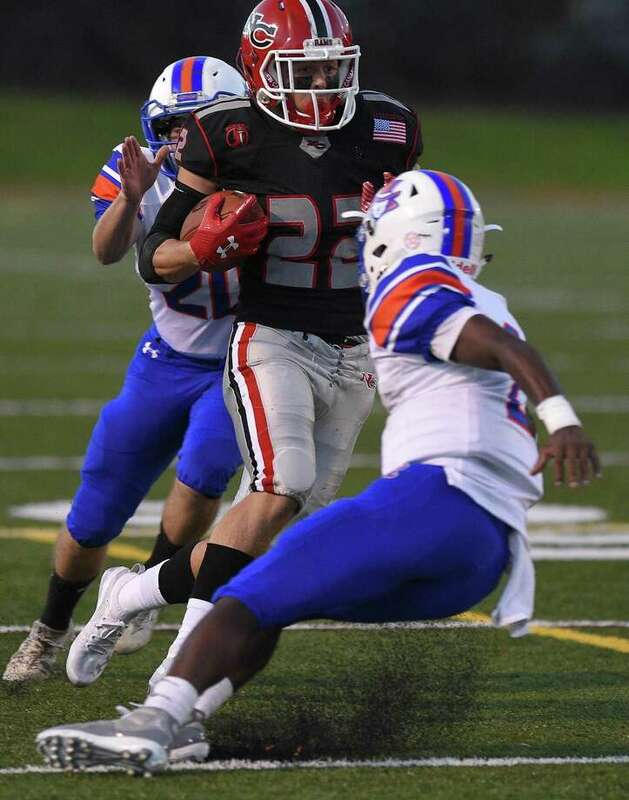 In the second, New Canaan got a 36-yard touchdown run by J.R. Moore, a 19-yard pass from Pyne to Luke Morton and a touchdown by Christian Gravereaux after Danbury muffed a kickoff and the ball rolled into the end zone. Danbury got a fourth-quarter touchdown on a 32-yard run by Jack Pompea. Quintin O’Connell, New Canaan: O’Connell cuaght two touchdown passes while playing with a heavy heart. The game was for Coop.